The sort of super-hero comics that I tend to discuss are off-beat in some way. The genre is usually at its best when it depicts motion, drama and action. Super-hero comics should have a propulsive quality to them and should be easily understood without even looking at the dialogue. Gesture and a body's relation to space and other bodies is crucial for such stories. The inherent fantasy limitations of super-hero comics limits its abilities to address certain ideas. Famous super-hero comics that deal with racism and other ills of the day almost always have a laughable quality to them, because the author's good intentions take the reader out of a believable sphere. That said, it's quite possible for super-hero comics to portray human interactions and dynamics in an interesting way, as long as the artist keeps everything within the rules of the world that we've been made familiar with. 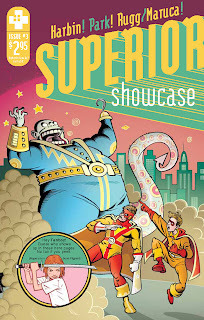 Chris Pitzer's AdHouse published a fine anthology featuring indy/alternative artists doing their take on superheroes called PROJECT: SUPERIOR. Like all the books he releases, it was beautifully-designed and had a number of stories that successfully told off-beat tales that succeeded because they stayed within the parameters of the rules the artists created. 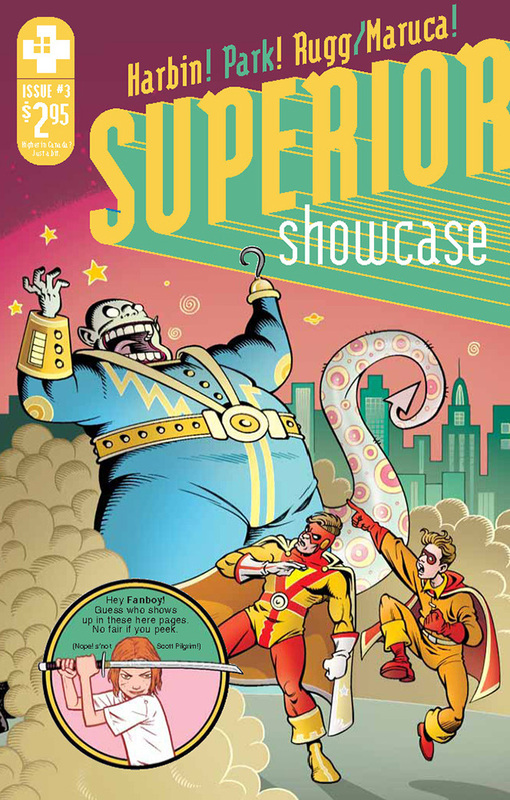 So many of the artists had such a good time doing it that Pitzer occasionally releases a new issue of a periodical called SUPERIOR SHOWCASE, featuring three stories in this vein. 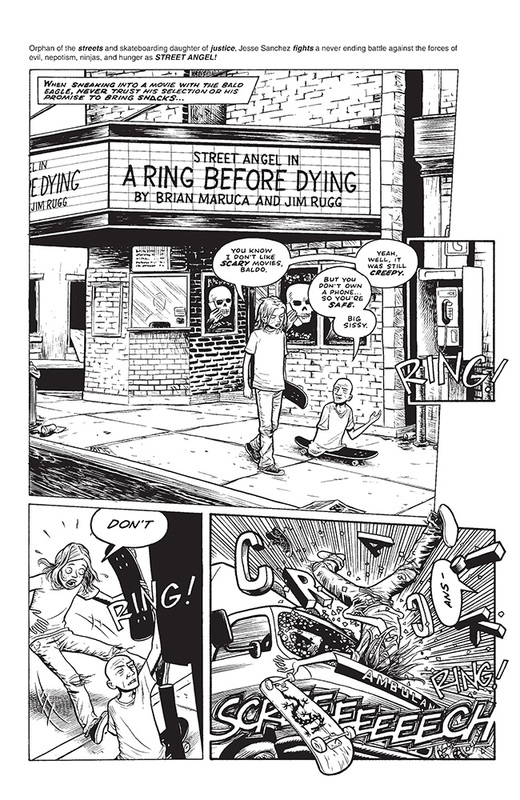 Issue #3 featured a Street Angel story by Jim Rugg & Brian Maruca, a tale of superpowered siblings by Laura Park and an extended superpowered fart joke by Dustin Harbin. The latter story is drawn in a lively, playful fashion. It really is one long series of fart jokes invoked by a superpowered kid on the teacher he has a crush on and a school bully. The story dragged a bit as the same set-up was repeated with different variations and eventually became quite tedious. Still, there's no question that Harbin has great chops. The Street Angel story perfectly encapsulates the idea of creating a world and staying consistent within its rules, no matter how absurd. For Street Angel, the young skateboarder/martial artist/orphan, it wasn't odd for her to wind up in a hospital where all of the other patients were ninjas. It also wasn't too strange for her to face a monstrous opponent who was straight out of The Ring, something that was alluded to from the very beginning of the story. 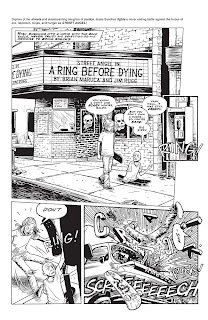 Rugg & Maruca tell a satisfying, very funny story that is told in an entirely deadpan fashion, while still being able to depict a lot of action. Laura Park's entry is a quiet, wistful story that just alludes to superpowers without showing us much of them. It's really about the relationship between two latch-key siblings and how they react to the way their peers treat them as freaks. The older sister is quite sanguine about it, thinking only of the welfare of her brother. The younger brother gets into fights when people insult his sister but is unable to fully articulate his rage. A loving gesture by his sister helps him start to deal with his feelings. This story is lovely because of the details Park includes: the way his sister goes about the rituals of cooking, cleaning, washing and sewing for him. It's unspoken, but in many respects she acts as surrogate mother, thinking of nothing but him and how to make him happy and well-adjusted. Those details, evoked by Park's use of shadow, cross-hatching and lively character design, make this tender story a true highlight. Brian Andersen's SO SUPER DUPER is similarly consistent in tone. That tone is one of constant, over-the-top enthusiasm as the story's hero, Psyche, deals with being an underpowered hero on a JLA-style team and his own repressed homosexuality. Psyche's the sort of gay man who is closeted pretty much only to himself, as virtually everyone else in the world knows he's gay. The funny thing about this comic is that it's incredibly sweet, goofy and good-natured. Andersen's art is crude and highly stylized, which somehow fits in perfectly with the ridiculousness of the scenarios he creates. Having Psyche get off witty, bitchy one-liners to the fairly square-jawed heroes surrounding him, stumbling around his own desires (very chastely depicted), and generally behave like the most hyper gay kid you've ever met is a delight. The effect is like reading a child's superhero comic, retaining a certain purity of design without a sense of self-consciousness or guile. One can feel Andersen's personality busting through on the page as he combines what is an obvious love of superheroes with a style of art and pacing that is pretty much the opposite of what one would expect from such comics. The comic works because Andersen takes this ridiculousness seriously, with detailed subplots surrounding the longer character bits much like a standard superhero comic. This comic couldn't be any more different from the ham-handed, tedious superhero comics that have appeared in recent years trying to deal with gay issues.